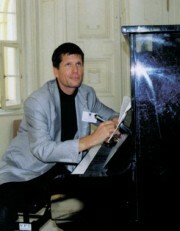 1981 Neue Kronenzeitung (Österreich): „As a composer, Soyka displays great sensibility for colours and intensification. As a conductor he was charismatic enough to „sell“ his music to the audience.“ (2nd concert for Saxophon, Großer Musikvereinssaal, Wien). 1986 Die Furche (Austria): „Beautiful new music“(Concert for Organ), Winterthur. 1987 Morgen (Austria): „Soyka´s music is committed to the twelve-tone system, but not to the dogmatic, serial kind. Rather it is an extended twelve-tone style, determined by melodic and rhythmic ideas, by emotions. It is just this emotional aspect which triggers an immediate response and understanding in the listener, even though one might not be able to follow every rational structure and detail. His tone language is varied, beautifully melodious as well as spirited and powerful in rhythm.“(Opera „Malya“). 1990 Ballett-Journal/Tanz-Archiv (Germany): „This ballet has every chance to make it into the repertoire“(world premiere of DAS IDOL). 1990 Der Standard (Austria): „Against oblivion and racist insanity... Soyka contributed clear, crystalline music.“(Ballet DAS IDOL, at the municipal Theater Klagenfurt). 1990 Die Furche (Austria): „..this dance symphony is flitting by... effortlessly employing the whole scale of romantic orchestration, albeit in a completely different sense than the late romantics of the 19th and 20th century. Soyka manages to reconcile two aspects which rarely coincide. On the one hand he is a natural musician, on the other a speculative esoteric of sound and the harmonic world. Thus he is deeply conscious of the conflict between twelve-tone music and the overtone scale. Yet his composer´s heart brings forth reconciliations which reason alone could never supply. The result is an amusing ballet music, deeply felt in its love scenes.“ (DAS IDOL). 1991 Neue Westfälische Zeitung (Germany): „Soyka showed that he has found a path for modern music beyond Stockhausen.“ (composer´s portrait, Warburg, Germany). 1994 NÖ.Nachrichten (Austria): „Ulf-Diether Soyka is among the few Austrian composers which in the course of their development have found their own unmistakable tone language.“ (Concerto for Cello). 1998 NÖ.Nachrichten (Austria): „Soyka´s beautiful setting of the 23rd psalm- pure balm for the soul (Schola Cantorum, Stift Klosterneuburg). 2003 The Horn Magazine (England): „There seems to be a „Third Viennese School“ evolving right in our present time... this music here of Ulf-Diether Soyka is melodious, charming and well worth being promoted“ (Fantasy, concert in Birmingham).